Last year we celebrated our 10 Yearn Anniversary along with 6 Utah cities having adopted Idle Free ordinances: Park City, Salt Lake City, Alta, Holladay, Logan and Murray. This year, joining them in adopting idle free ordinances was Sandy City and Cottonwood Heights. Utah had the first Idle Free campaign in the nation. Now 8 cities within the state are taking Idle Free seriously in their cities and for their citizenry. Idling vehicles emit particulate matter and other pollutants that are known to cause serious health problems. Vehicle exhaust makes up about half of the air pollution in Utah, and unnecessary idling contributes a significant amount of emissions into our air shed each day. Idling gets zero miles per gallon. Air quality is a complex issue. There is no “silver bullet” solution to solving our air pollution challenges. You may ask yourself as an individual, as a member of your community and a citizen of the state of Utah what can you do? It is simple. Turn Your Key, Be Idle Free. It’s a ten second commitment and everyone can do it. We are all in this together. The Governor’s Declaration will be read on Tuesday, September 18th, at 10:30 am at the City and County building, downtown Salt Lake City. 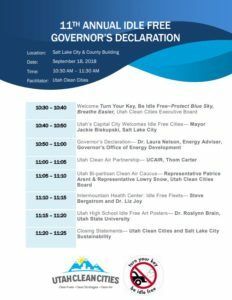 WHAT: Utah Clean Cities, Governor’s Office of Energy Development, and Salt Lake City Sustainability will celebrate the 11th Annual Governor’s Declaration Idle Free Month of September and the kickoff of the 2018-2019 Idle Free Season. Currently signed by 71 mayors, Utah had the first Idle Free campaign in the nation, which continues to play a vital role in the state’s progress towards air quality. The event will highlight the addition of over 20 mayors since last year’s 10th anniversary.